Jar2Exe is a tool to wrap jar files into binary exe files for Windows and Linux. To start java from generated exe files is more convenient: 1) Easy to start, generated exe files will find JRE on host by itself. 2) Easy to configure, generated exe files are configurable for Java vm parameters or options defined by Jar2Exe. 3) Safe to redistribute, jar files are encrypted and hidden into exe file. So the java program cannot be extracted and decompiled. 4) Function enhancement, generated exe files have many function enhancements, such as you can run java program as a Service on Windows and Linux without developing with OS. About Jar2Exe itself: 1) Jar2Exe supports Wizard Mode and Command Line Mode to run. 2) Jar2Exe runs on Windows, but Jar2Exe can generate exe files for Windows and Linux. 3) 32 bits and 64 bits supported, 64 bits edition of Jar2Exe can generate both 32 and 64 bits exe files. 4) Jar2Exe can generate “Console”, “Windows GUI”, “Service” 3 types of applications. 5) It supports to pack depended jar files into a single exe file. The develop license is free. If you want to redistribute generated exe files to your customers as a product, you need to purchase Jar2Exe. 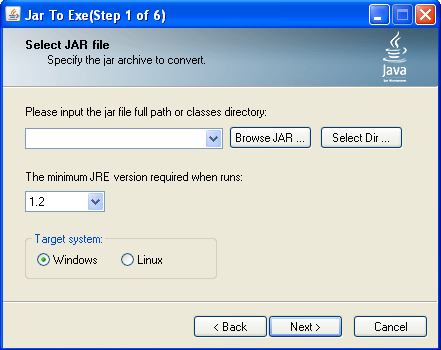 Without purchase, you are allowed to use Jar2Exe for developing, test and demonstration. Code Line Counter Pro – Java Version may be helpful for SQA, Java programmers, project managers and other customers who need an overview of a project source code. 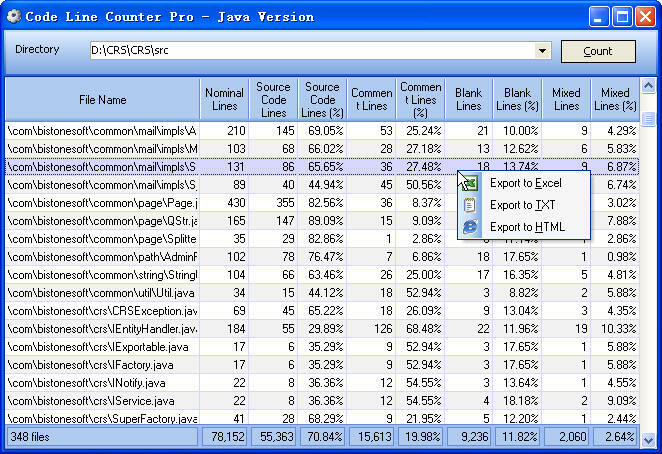 This easy-to-use application will help you get detailed reports on the source code.With the help of Code Line Counter Pro you can quickly and easily get a report on software source code in Java. Key Features: Able to count Java language. Support subfolders and multi-types count. Full report on the code: – number of source code lines – number of blank lines – number of mixed lines (code and comments) – percentage of comments, blanks and source code. Sorting the report by any column of the table Counting totals in the report (sum total, percentage) All reports can be exported to a variety of formats: Excel, plain text and HTML. 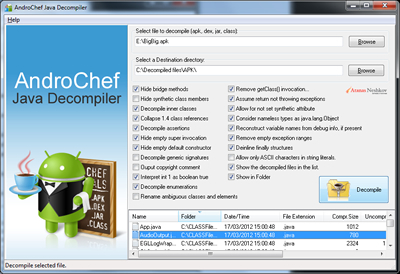 AndroChef Java Decompiler is Windows decompiler for class, jar, apk and dex files. It reconstructs the original source code from the compiled binary CLASS files (for example Java applets). AndroChef Java Decompiler is able to decompile the most complex Java 6 binaries, producing accurate source code. Using AndroChef Java Decompiler is easy: Select the file (apk, dex, jar, class) you want to decompile. Select a folder to decompile file to (Destination directory). Click on “Decompile” -button. Selected files will be decompiled to the location you choose. AndroChef Java Decompiler is able to decompile the most complex Java 6 applets and binaries, producing accurate source code. DJ Java Decompiler is Windows 95, Windows 98, Windows 2000, Windows XP, Windows 2003, Windows Vista, Windows 7 decompiler and disassembler for Java that reconstructs the original source code from the compiled binary CLASS files (for example Java applets). DJ Java Decompiler is able to decompile complex Java applets and binaries, producing accurate source code. It lets you quickly obtain all essential information about the class files. DJ Java Decompiler is a stand-alone Windows application; it doesn’t require having Java installed! DJ Java Decompiler is not just Java decompiler and disassembler but it is also a fully featured Java editor using the graphical user interface with syntax-coloring. Using DJ Java Decompiler is easy. Select “Open” and load your desired class file, or just double-click the CLASS file you want to decompile. 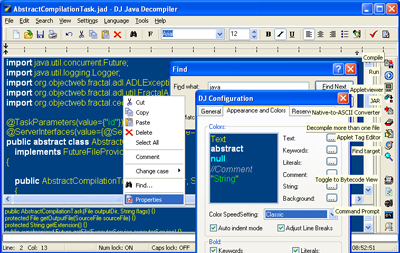 DJ Java Decompiler supports drag-and-drop functions for OLE. You will see the source code instantly! In “Windows Explorer” Right mouse-button pop-up menu available too. You can decompile or disassembler a CLASS files on your computer hard disk or on a network drive that you have a connection to (you must have write privileges or just change the default output directory for .jad files). You don’t need to have the Java Virtual Machine or any other Java SDK installed. But this release is able to compile, run, create JAR archives and run applets outside of the context of a Web browser when JDK is installed. With DJ Java Decompiler you can decompile more than one java class file at one time. “Tools”-> “Decompile more files…” allows you to select and decompile more than one Java compiled file at one time. Also, this release enables users to decompile “dead” parts of code. It can add the original line numbers as the comments in the decompiled file, that is very useful for debugging. DJ Java Decompiler is suitable for studying JAVA bytecode. The program enables users to save, print, edit and compile the generated java code. Included Applet Tag Editor enables users to create applets quickly. Included “Archiver” tool is a simple archive file manager wich enables users to work with .JAR, .ZIP, .APK, .EAR, .WAR and .EXE archives. (see New features in version 3.11.11.95 and New features in version 3.10.10.93). This tool lets you create or view archives, extract files from archives, decompile .class files from archives, etc. The option “Use folder names stored in archive” enables users to decompile whole class tree. The “Hexadecimal View” – F11 shows the file in hexadecimal. This view lets you examine the file at the lowest possible level. Special information features added in this latest version: “Class version info” (shows the JVM version, Major and Minor version), “Access flags”, “Superclass”, “Methods, Interfaces and Constant Pool”, “Fields”, “Attributes”, “General Information”. DJ Java Decompiler is a graphical decompiler and disassembler for Windows 2000/XP/2003/Vista/7 that uses the command-line version of Jad as its decompiling engine . Javelin features an easy to use, intuitive user interface to increase your productivity and understanding of the classes and relationships in your Java projects. Get productive in less than 15 minutes with the ‘Getting Started Tutorial’. Javelin’s extensive use of the right mouse click context menus enables fast, easy access to the most common operations while providing an uncluttered user interface. Javelin’s class lister makes finding a class in a large project easy. Javelin is a customer driven product and has almost a decade of development and refinement behind it. It shares a common code base with our successful Visual Classworks for C++ product. Javelin also feature a useful import feature that allows you to import any existing Java code into Javelin. Take advantage of the latest advances in object model driven software development with Javelin today!